One of the most important factors in making a great cup of French press coffee is making sure that your coffee beans are ground properly. If the grounds are too fine, you will end up with sludge at the bottom of your cup that looks like something you might find at the bottom of an oil barrel. If the grind is too coarse, you will not get the most flavor and aroma out of your beans. The following guide will walk you through the fine art of grinding coffee for a French press as well as choosing the best tool for the job. Fine, Medium, or Course: What Grind for French Press Coffee? When using a French press, you want to choose a grind that is coarser than what you would use for an automatic drip coffee maker. The exact level of grind is determined in large part by the type of filter that you use. A metal filter will require a larger grind than a nylon filter with a much smaller mesh. In most cases, grounds that are still distinct particles with a texture similar to potting soil are the optimal French press grind size. The technique for grinding your coffee depends on whether you choose a blade or burr grinder. Blade grinders tend to be the least expensive; however, they can be noisy, messy, and produce an inconsistent grind. The fact that the grounds are not of a uniform size and shape can mean that the extraction is not smooth and complete. Blade grinders also heat the beans, which can affect their flavor. The important thing to remember when using a blade grinder is that you cannot just put the beans in and grind away. To keep the coffee from overheating, you should grind the beans in short bursts of no more than a few seconds. Be sure to give the grinder a quick shake in between the bursts to redistribute the grounds so that you will end up with a more consistent grind. A course grind should take no more than about 8 to 10 seconds. Although they are more expensive, burr grinders are preferred by most coffee aficionados. 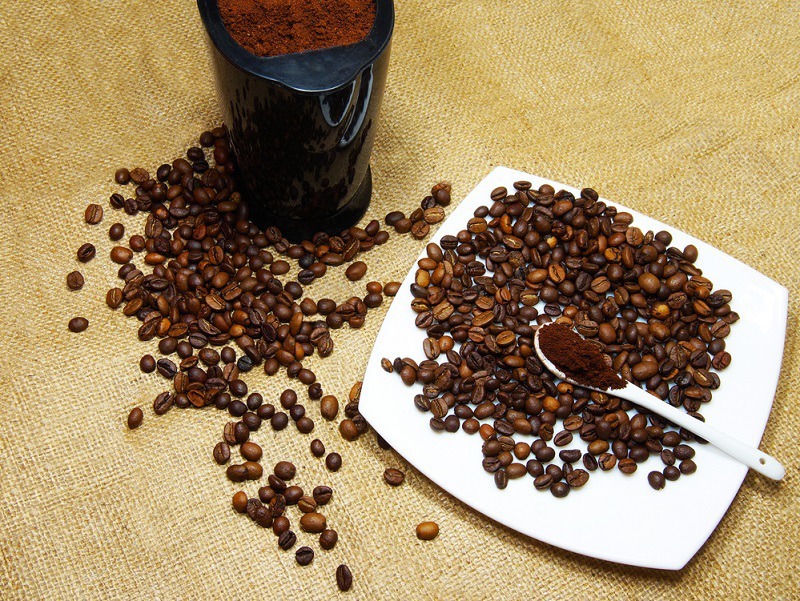 A burr grinder slices the beans into consistent particles instead of pulverizing them. Most models also provide more control over the size of the grind, so you can experiment to find the grind that produces your perfect cup of coffee. Burr grinders operate at a slower and produce less heat, so you do not risk overheating the beans. This grinder measures approximately 6 inches x 7 inches x 11 inches. The overall construction is sleek, elegant, and durable enough to withstand regular household use. The exterior is stainless steel with black accents, which means that it will fit into virtually any kitchen décor. Outfitted with a heavy-duty motor, the Cuisinart Supreme Grind offers 18 different grind settings from fine to extra coarse. The machine features an 8-ounce hopper and a sliding dial capable of producing enough grounds for up to 18 cups of coffee. On a medium setting, the Cuisinart grinder will generate grounds for 18 cups of coffee in under a minute. This grinder tends to be rather noisy; however, it is not a significant problem since it does grind quickly. The Cuisinart Supreme Grind is a 100-watt grinder. The machine features a removable hopper and grind chamber that are both dishwasher-safe. There is also a combination scoop and cleaning brush that makes for easy daily cleanup. Cuisinart offers a limited 18-month warranty. 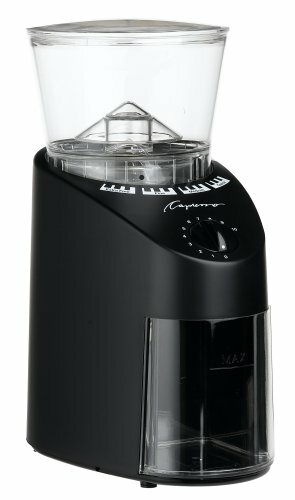 For the price point, the Cuisinart Supreme Grind Automatic Burr Mill is a good entry-level burr grinder that produces a relatively consistent result in a variety of grind sizes. On the other hand, some users have experienced problems with the motor burning out prematurely, so it may not be the most durable option. The Capresso Infinity Burr Grinder measures approximately 11 inches x 8 inches x 5 inches. The machine comes in black, stainless steel, and polished chrome and has a sturdy, contemporary aesthetic. The basic functionality makes the Capresso user-friendly. The commercial-grade burrs produce a precise grind ranging from extra fine to coarse. The slower grinding speed creates less heat, which helps preserve the aroma and flavor of the coffee. The machine has on/off buttons to allow for pulse grinding. You can also set a timer anywhere from 5 to 60 seconds for your preferred grind. The hopper holds nearly 9 ounces of beans to produce up to 4 ounces of grounds. As far as coffee grinders are concerned, this model is relatively quiet thanks to its gear reduction motor that operates at less than 450 rpm. 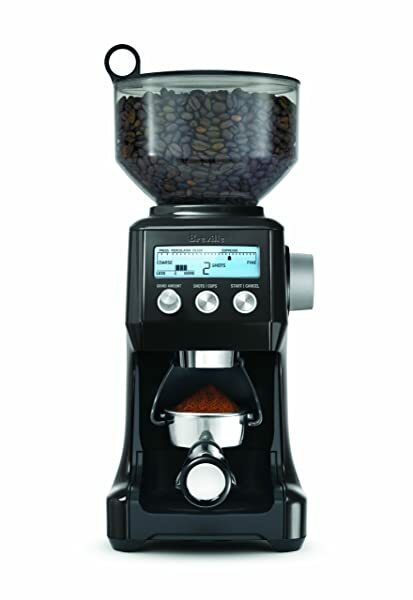 The Capresso Infinity is a 100-watt burr grinder offering 16 grind settings. The hopper and upper burr are removable. The machine also comes with a brush so that you can clean the grind chamber easily. Capresso offers a 1-year limited warranty. The Capresso Infinity Burr Grinder is sturdy, user-friendly, and does a good job of providing a consistent grind. The low motor speed means that you do not sacrifice the flavor of your beans, and you will not necessarily wake up everyone in the house when making coffee first thing in the morning. It does not feature an anti-static coating, so the grounds tend to jump around. The grind level at the fine settings may not be quite fine enough for espresso. The Breville Smart Grinder has a rather high-tech appearance thanks to its backlit LED screen that displays the grind size, customized grind amount, and number of shots or cups. It measures approximately 6 inches x 9 inches x 15 inches. The burrs are made of stainless steel to minimize heat buildup during the grinding process. The hopper holds up to 1 pound of beans and features an air-tight lid. This allows you to store the beans at the optimal temperature. You can choose up to 25 grind settings suitable for everything from espresso to French press. The Breville Smart Grinder also has an automatic dosing system that calibrates every time that you change grind settings so that you get precisely the amount of grounds that you need. You can also manually adjust these settings to suit your personal preferences. The Breville is less noisy than most comparable grinders. The Breville is a 165-watt grinder. The machine comes with a cleaning brush and disassembles for easy cleaning. It also features a removable tray to catch any overflow grounds and prevent countertop messes. Breville offers a 1-year warranty. The number of settings and adjustable dosing features place the Breville Smart Grinder above the traditional entry-level grinder. The quality of the grinding, ease of cleaning, and durable construction make the Breville a good value for the price. Novice home baristas may find the number of settings and somewhat complex digital screen a little overwhelming. The computerized parts can also make repair and maintenance more problematic. The Bodum measures approximately 6 inches x 11 inches, by 5 inches. It comes in black, white, green, red, and orange. It is made from borosilicate glass, rubber, silicone, plastic, and steel. The fact that the container is made from glass means that it is static-free so that the grounds do not jump around. You adjust the grind size by twisting the hopper, so there are no complicated dials or displays. The Bodum features a 7.8-ounce hopper and an 11-ounce collection container. Grind levels are continuously adjustable over 14 settings ranging from fine to coarse. A pre-set timer lets you select the precise amount of coffee that you need, which limits wastage. The motor operates at 720 rpm, so the Bodum may not win an award for quietness. You can reduce the noise somewhat by placing the grinder on a mat to muffle the sound. 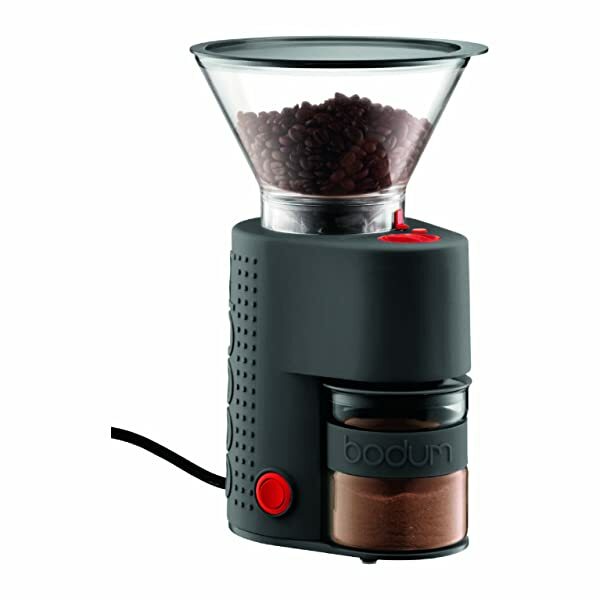 The Bodum has a 160-watt motor. The glass container is easy to clean since there is no static to hold onto the grounds. The silicone sleeve on the outside of the container helps prevent breakage by keeping it from slipping out of wet hands when washing. The manufacturer offers a 2-year warranty against defects. The Bodum has a small footprint, so it works well for small kitchens with limited counter space. It has a straightforward design and operation. The smaller hopper size means that this grinder may not be the best option if you need to grind a large amount of coffee at one time. Having to change the settings by twisting the hopper is also not very convenient if you need to change grind sizes frequently. This is a “no frills” blade grinder with settings for fine, medium, and coarse grinds. It has a large “press and pour” lid for easy loading and dispensing of the grounds. This grinder measures a mere 5 inches x 5 inches x 9 inches, so it takes up very little space on your counter or in your cabinet. A simple LED display allows you to select the cup size and level of grind. The Mr. Coffee can hold enough grounds to produce up to 12 cups of coffee. The automatic shut off ensures that you will not end up with too fine of a grind, and you can walk away during the grinding process. The motor of the Mr. Coffee runs at a high rpm, so this is not a quiet coffee grinder. 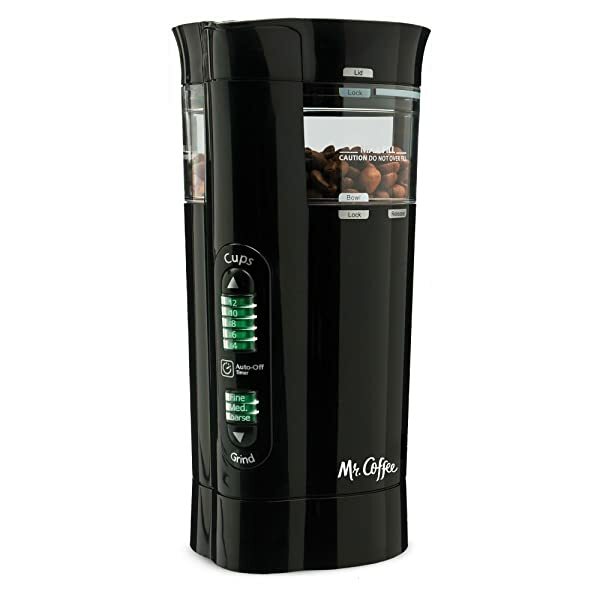 The Mr. Coffee grinder uses 120 volts. The electrical cord may initially appear to be too short; however, the extra cord is tucked away under the bottom of the grinder and can be adjusted to the length that you need. One of the best features of the Mr. Coffee grinder is its Chamber Maid Cleaning System that automatically sweeps leftover grounds from the chamber wall. The chamber is also removable and dishwasher safe. Mr. Coffee offers a 1-year limited warranty. If you are an avid home barista, the Mr. Coffee grinder is probably not for you. It offers very little flexibility over the grinding process. If you do not give the grinder a little shake while grinding, you can end up with inconsistent grounds. On the other hand, if you are looking for an inexpensive grinder that will get the job done, the Mir. Coffee will certainly meet your needs. The most budget-friendly grinder is the Mr. Coffee 12 Cup Electric Coffee Grinder with Multi Settings, which can generally be found for under $30. 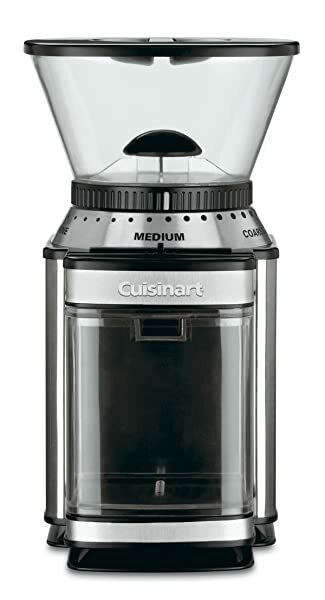 The Cuisinart Supreme Grind Automatic Burr Mill is a good option for those who consistently make large amount of coffee since it can produce grounds for up to 18 cups of coffee in under a minute. The Capresso Infinity Burr Grinder has the most professional burr system and produces the most consistent grind. It is also one of the quietest home grinders. The Breville Smart Grinder offers the best hopper capacity and the most flexibility in terms of grind settings. The Bodum Bistro Electric Burr Coffee Grinder has the most intuitive operation and design of the burr grinders on this list. It is also the only one to deal with the issue static build-up in the chamber.